I have no good reasons why I don’t update this site more often. I have the best intentions but they never come to see the light of day. I was thinking about posting today and I glanced over on my wall and saw this picture. Now it may not be much to look at. 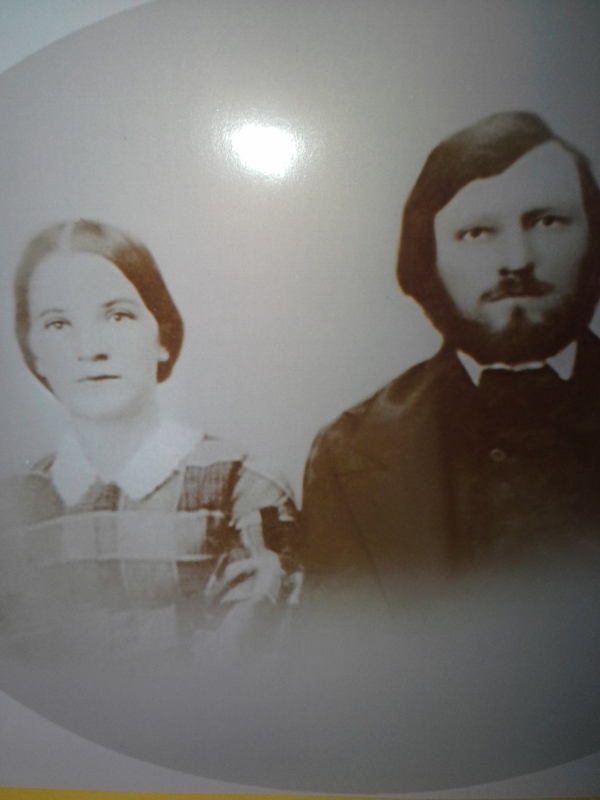 This is my 4th great grandfather Luther Blanchard and his wife Martha. A while ago a wonderful new cousin (someone I connected with on Ancestry) wrote a message to me. She shared that we had a common ancestor in Luther and she wanted to know what I knew about my side of the family. She said that she had a picture and was willing to send it to me. I was completely shocked because Luther is the grandfather of Aimee Fuller, who you all know is the reason I started researching my family history. No one in my family had ever seen a picture of these two so I had no idea what to expect. To say that I was completely shocked was an understatement. Martha looks almost exactly like my mother and a I have a lot of Luther in my face now as well. I love this little note. I now know where my red hair, which also turned to brown came from. No one in my family was born or had red hair. I always thought I was adopted because of this. At least I would think this when I was angry at my mother. I have always heard about people meeting relatives on Ancestry or through other genealogical searches and I’m happy to say I have one now. Week One of my Genealogy Do-Over is just about over. I’m finding it difficult to focus on one person at a time and not to put in the details that I think I know. I want to just jump ahead and go to the families that I know need work and not build the foundation that I know I need. It’s going to be a long process, but I’m off to a good start I think. I’ve been considering my family history a lot lately. With the holidays I’ve decided that it’s time to give my ancestors some much needed love. I’ve bought a new laser printer and I’m ready to do this the right way. The problem is that I have no idea where to start. I read this article Genealogy Do Over and I’ve decided to give it a go. I have been fortunate that I have someone on my father’s side that is now willing to share what they know about their parents and grandparents. In my haste to discover as much as I can I relied too much on other’s trees. I expected that since their research was so well documented and they had a ton of pictures of my family, their trees were as close to accurate as I could get. Now I’m not so sure as I take a closer look at the individual people on the tree. So I am going to put everything aside and go with what I know to be true. I have many lines of my family tree dating back to the 1600s in the US. I can’t wait to see how much is correct and how many of the people I’ve grown to love I will have to say goodbye too. I’ve said this before but I hope that I can blog my journey along the way and maybe make a feature out of some of my surnames. I’m excited to get my hand wet and dedicate more time to this everlasting hobby/obsession. Part of my Bain Family line. Connections I found through Ancestry. Photo credit is not mine. Matthew Terrell with son Harry. Photo credit Patrick Gilmore. As part of review the documents of my new found Bain family line I have come across something excited to me. My 7x great grandfather Daniel Preston of CT was involved in the Battle of Bunker Hill. This battle is perhaps the most well known to my family and I’ve always wanted someone to be involved in it. Of course I’m saddened that he was injured which caused him to lose full motion of his right arm I am happy that this was recorded. 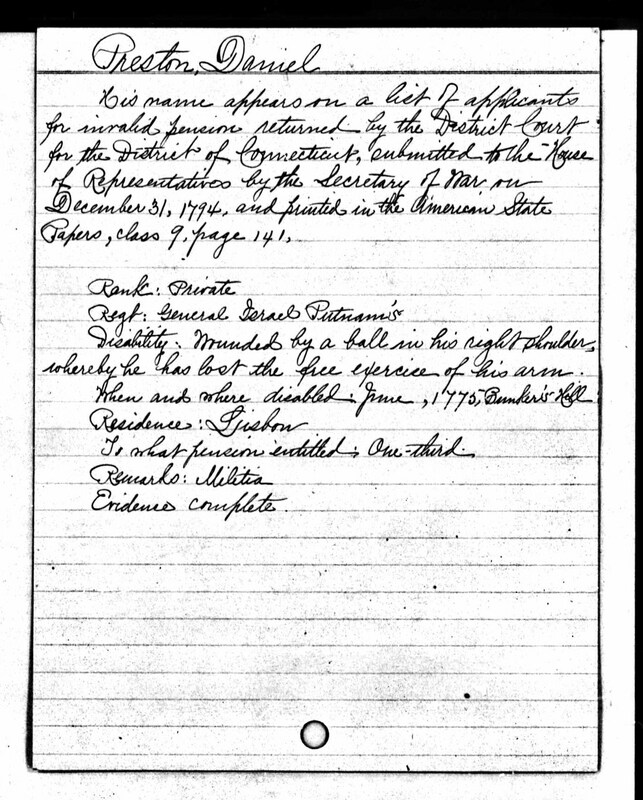 I found this document as part of Ancestry’s Rev War Pension Files. Recently I have had the wonderful fortune to connect to a couple distant cousins on Ancestry. I’ve seen lots of people who have stories about this, but it’s never happened to me until now. As many of you know, I am not close to my paternal side of my family. Up until three weeks ago I only had the names of my grandparents. After some heavy nudging from an Aunt, I finally got some details on my paternal ancestors. A quick input into Ancestry and I was directed to Kim and Patrick’s trees. Thankfully they had a ton of pictures and stuff on my ancestors. It was like hitting the motherlode. Unfortunately I only had a couple weeks left on my Ancestry account so I tried to get as much info as I could as fast as I could save it. That meant that I couldn’t go through each piece of documentation I could as thoroughly as possible. 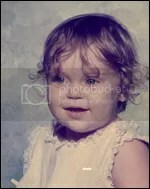 I downloaded a ton of census records, birth/death/marriage, pictures, and other documents to verify once my account was cancelled. Anyway that was a few days ago. I’ve been slowly going through the documents and I came across this interesting (at least for me) 1900 Census. It’s from Pennsylvania for Abraham Bain and his family. You can click on the image to make it bigger if needed. I’ve noticed that a lot of my Bain family worked on the railroads. That in itself was interesting because most of my maternal side were farmers or shoe makers. It was nice to see something else. This was a normal looking census with normal jobs on it until I got to my 2x great grandfather’s trade. I had to ask my Facebook group to be sure, but it says “Heater Boy”. Being completely new to occupations other than farming I had to look it up. I haven’t found any information on that trade specifically, but someone was able to find it on the Alphabetical Index of Occupations and Industries in 1960. There is says that a “Heater Boy” worked in the metalworking field. However I think in Harry’s case it was the heaters on the railroad engines. I don’t’ know much about this railway in this time period, so maybe someone can help me out a bit. In later census’ Harry has become a Railway Car Inspector, which further makes me believe that was what he was working on in 1900. For me this is what Family History is all about. Learning how our families lived and what their day to day life was all about. I look forward to learning a lot more about my new found branches. 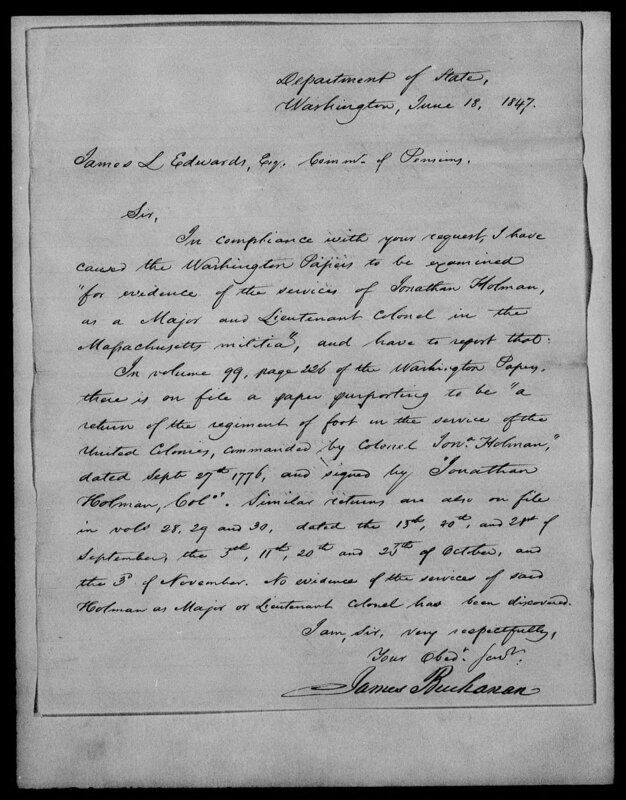 While researching the Rev War pension records of my 7th great grandfather Col. Jonathan Holman I came across this document. From the other documents in this file I was able to assume that Jonathan’s second wife was trying to get the pension he was owed after he died. I can also assume that this was something she was using to prove his service in the Revolutionary War. To my understanding Washington wrote the “Washington Papers” right? If that is true, why does this say that Jonathan Holman signed his own account in them? Or am I reading this completely wrong? The other question I have is the reason it says that no record of service could be found when it plainly says that he returned with a regiment? As if this document wasn’t exciting enough. At the very end it is signed by “James Buchanan”. Putting that with the fact this came from the Department of State during the time Mr. Buchanan was Secretary of State (1845-1849), can it be safely assumed that this James Buchanan is the same one who became the 15th President? Just finding documents on my ancestors is huge for me. But this one has kept me on the edge of my seat for a few days now. I just did a Google search for James Buchanan’s signature and this is what I found. I think it’s pretty darn spot on to the signature in my document. It’s pretty exciting to know that this one document ties my ancestor indirectly to two presidents. And the fact that James Buchanan did a little research on Jonathan Holman is beyond words. No matter the outcome. This is why I love genealogy. In the last post I mentioned that I had looked up a bunch of my relatives in Vermont Newspapers. While researching Jason “Elroy” Fuller, I came across something interesting. One of the first things I found while researching him for the first time was this bio in the book Genealogy of Some Descendants of Thomas Fuller of Woburn. By: William Hyslop Fuller. As you can see it says that Elroy lived in South Dakota for 8 years. 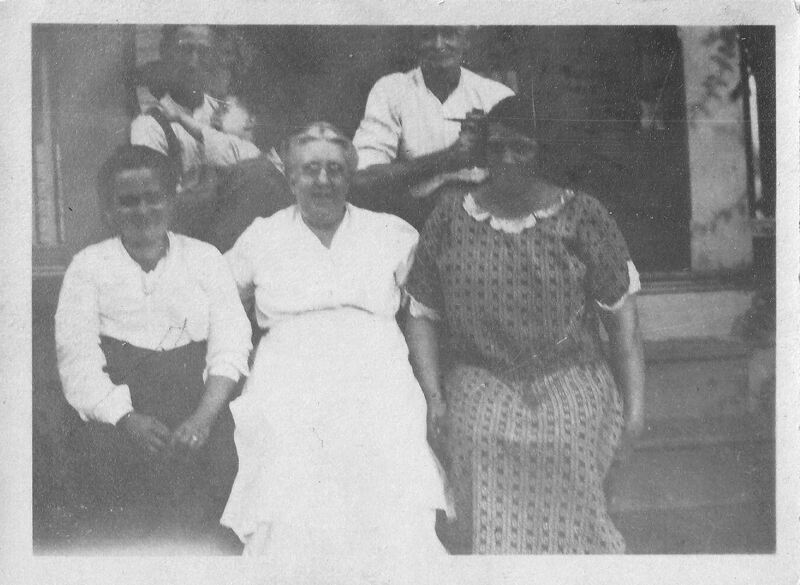 Being a decent genealogist I know that sometimes you have to take these family histories with a grain of salt. For nearly a year I couldn’t find anything that lead me to believe that Elroy really went to South Dakota. Why would he leave his wife and eight young children alone for such a long period of time? While searching the newspapers I found something interesting. So it turns out that the family history of Thomas Fuller was correct. Elroy did in fact go to South Dakota. Apparently he didn’t tell anyone that he was leaving. Which made me wonder why there of all places he could travel in the US. As far as I knew my ancestors had no connections to that part of the country. I didn’t find anything on when Elroy came back to Vermont, but I knew that by 1915 he had passed away in Roxbury, VT.
Luther’s second wife was Lydia Hackett, William’s sister. This was the SD connection I was looking for. While William was visiting his sister he must have been introduced to Elroy. What I still don’t understand and probably never will, was why he left for such a long time without taking his family with him. And what was he doing up there? This information that Elroy traveled to South Dakota is huge for me. My mother and myself are somewhat of the black sheep in our families. We like to travel, not just travel, we moved.. a lot. Knowing that one of our ancestors moved so far away from his family makes us happy to know that we aren’t the only ones. And it’s possible we got it from him. My question to you guys is this: Is there a place I can look for records about his time in SD? I’ve tried Ancestry and Family Search. I don’t have any ideas from there. Any help would be wonderful.